It’s no secret that I love to use various spices in my smoothies to boost nutrition and improve the taste. This recipe calls for one of my favorites, ginger. With ginger you get that signature peppery, sweet taste and a bunch of health benefits. Combined with a little spinach, frozen blueberries, and banana, and you’ll be rocking one healthy smoothie! Quick aside, I recently purchased a new grater by Kyocera (Kyocera ceramic grater), which makes grating things like ginger and turmeric a breeze, and actually kind of fun. You can pick one up from Amazon for around $20. Highly recommended. Don’t limit your ginger usage to smoothies alone; use it when sauteing vegetables, making homemade salad dressings, rice dishes, and anything else that could use a little spice. Now that you’re sold on ginger, it’s time to blend up this delicious smoothie. 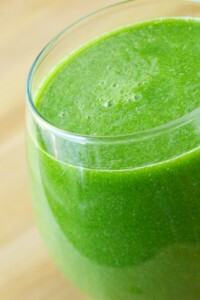 Try this ginger spinach green smoothie recipe? Please leave a comment below and tell me all about it. Happy Blending! The ginger spinach smoothie was great! And I always have those ingredients on hand! Thanks for sharing, I’m glad you enjoyed it! Good smoothie, very refreshing. Tastes better with honey added and a banana that is well ripened. Hey Tod, I rarely mention that, but yes a ripened banana is key. Cheers! So good! Drinking it right now! Jealous…wish I was drinking this smoothie right now too :) Maybe for breakfast tomorrow. This smoothie is awesome!! I drink it before my morning runs!! Thank you so much for sharing!! Is there a good alternative for the avocado? You’re welcome! Great to hear you enjoyed this smoothie. Fruit usually does provide enough sweetness. I loved this smoothie! I added coconut water instead of regular water and some pineapple to make it a little sweeter. Very tasty!! Coconut water and pineapple were a nice touch, Tami. To your list of ginger benefits you should add it relieves menstrual cramps! And the spinach with iron on top of that makes for a great smoothie for that time of the month (what I came looking for). Enjoyed the smoothie, but was put off by the grossly misleading pic. With blueberries it will not be green. That’s a stock image, which I used for a few smoothies before I started taking my own pictures. Sorry, didn’t mean to mislead anyone. Awesome! I found this by accident as I had started making my favorite, avocado ginger lime, then found I was out of limes. Reminds me of a ginger cookie. Awesome is good :) Thanks for sharing, Leah!